Sanford Burnham Prebys Medical Discovery Institute (SBP) is an independent nonprofit medical research organization that conducts world-class, collaborative, biological research and translates its discoveries for the benefit of patients. SBP focuses its research on cancer, immunity, neurodegeneration, metabolic disorders and rare children’s diseases. 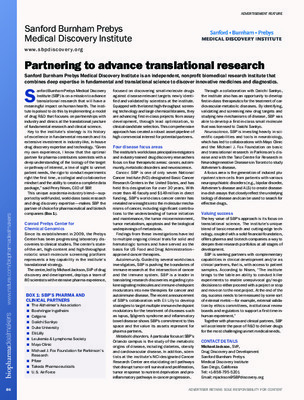 The Institute invests in talent, technology and partnerships to accelerate the translation of laboratory discoveries that will have the greatest impact on patients. Recognized for its world-class NCI-designated Cancer Center and the Conrad Prebys Center for Chemical Genomics, SBP employs about 1,100 scientists and staff in San Diego (La Jolla), Calif., and Orlando (Lake Nona), Fla.